Search engine optimization (SEO) has become increasingly important for e-commerce businesses as a method of increasing organic growth and traffic to their site. SEO, as described by Search Engine Land, is “the process of getting traffic from the ‘free,’ ‘organic,’ ‘editorial’ or ‘natural’ search results on search engines.” SEO is seen as an alternative method from paid online advertising that delivers a higher return on investment. Every search engine uses web crawlers to scan websites and determine the contents of the site. This information is used to rank websites based on user preferences. In a video produced by Search Engine Land, the process is explained within a library analogy. If search engines are a library containing all of the world’s knowledge, they need a system to determine which books (websites) are important to readers and answer all their questions. SEO is the process of a website including aspects that best meet a search engine algorithm’s requirements. Google and other major search engines have made the SEO market more competitive over the years, in order to increase the value of achieving a high-ranking website. They sometimes make decisions as subtle as decreasing the number of organic blue links displayed from 10 to 8.5 on average in 2016,according to Searchmetrics. However, ranking highly on Google has become increasingly competitive due to their growing share of the search engine market. As of 2016, Google accounts for 76 percent of global desktop search traffic whereas Bing, Baidu and Yahoo make up for 22.5 percent of the market combined, according to NetMarketShare. E-commerce websites benefit especially from SEO by driving organic traffic to their sites, increasing the probability that certain key performance indicators are met. The return on investment for SEO is higher than purchasing an ad campaign through Google AdWord, AdSense or online advertising space purchased on specific websites. Still, EMarketer forecasts estimated U.S. digital ad spending reached $72 billion in 2016. By prioritizing SEO, businesses are meeting the search needs of consumers and increasing the probability of higher traffic without having to overly spend on advertising. Dirxion online catalogs offer SEO guide pages that involves a process of indexing every page of the printed catalog. This practice helps boost the overall SEO of the online catalogs site, as well as increase the likelihood of someone finding a catalog page when searching for specific products. 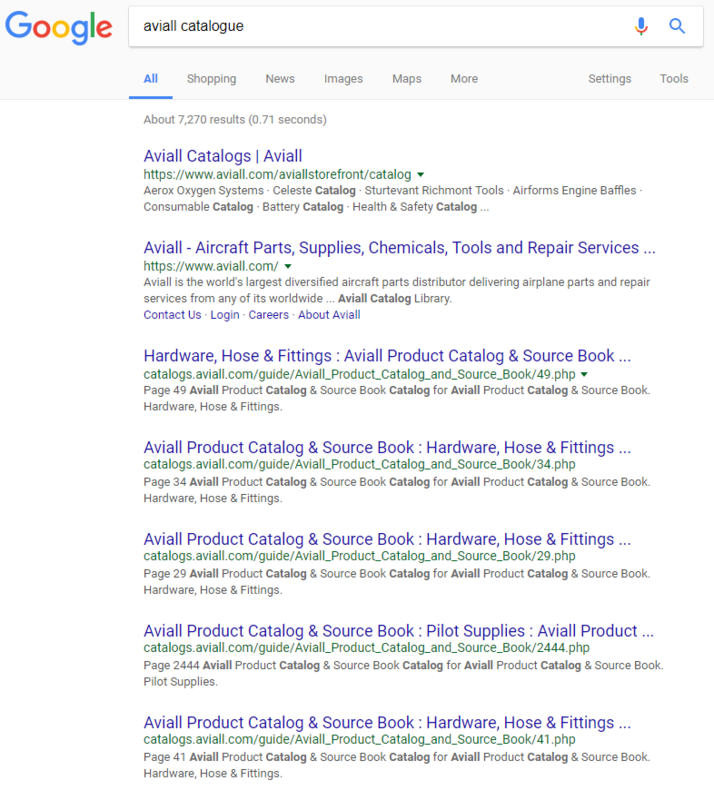 Such is the case for Dirxion customer Aviall, whose online catalog pages can be found on search engines like Google and whose primary site (catalogs.aviall.com) shows up at the top of Google when searching for “aviall catalog” or similar terms. Estimates from eMarketer calculate B2B companies spent $4.07 billion on online advertising in 2017. In 2018, the spending is expected to increase 13 percent to 4.6 billion. Across the board, companies are pouring more money into technologies that allow them to place advertisements where their customers are. While traditional media still has a place in advertising, consumers have transitioned an increasing portion on their lives online and businesses have followed. 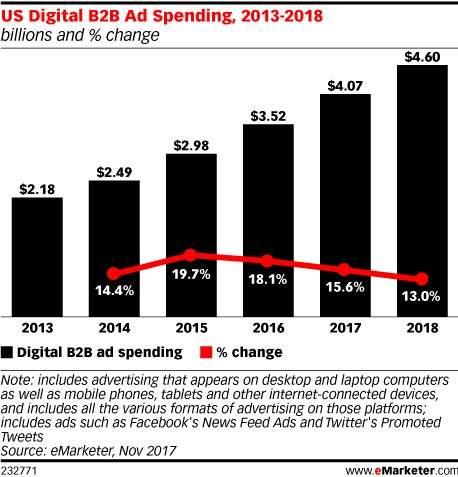 While the 13 percent increase in online advertising spending is in the double digits, 2018’s predicted spending growth is the lowest in recent history. The percent change in spending from 2014 to 2015 was the largest with 19.7 percent. However, the B2B industry has maintained an online advertising spending growth of roughly 16 percent since 2013. When compartmentalized by technology, desktops/laptops and mobile have similar shares of the online advertising spending from U.S. B2B businesses. According to a study conducted by eMarketer, desktops and laptops took up $2.54 billion whereas spending for mobile devices was $1.53 billion. When analyzing B2B online advertisement buying budgets, AdWeek discovered they’ve grown by 111 percent over the last five years. However, while online advertising has had double digit growth for years, many B2B businesses still prefer other traditional and time-tested methods of advertisement. Ytel, a communications company, conducted a survey which asked 2,000 B2B businesses their preferred outreach tool. 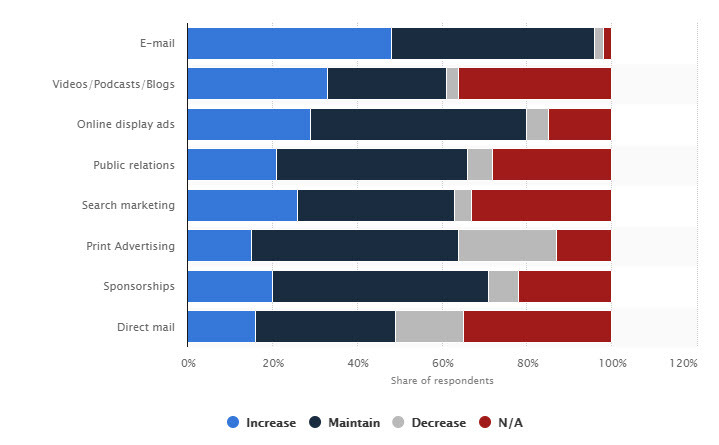 Online advertising was the least popular answer tied with direct mail at 7 percent each. Email was the most popular answer with 39 percent. Dirxion online catalogs give B2B businesses another avenue in an omnichannel marketing approach and allows them to capitalize on the rise of the B2B e-commerce market. For B2B businesses with many catalogs spanning multiple departments of their company, Dirxion’s bookshelf feature organizes the individual catalogs on a central landing page and integrates cross-catalog searching. Existing e-commerce platforms can be integrated into the catalog or B2B businesses can employ the Dirxion order form feature to generate a request for a quote. Many retail businesses experienced growing pains due to the market’s shift towards e-commerce and the omnichannel shopping experience. 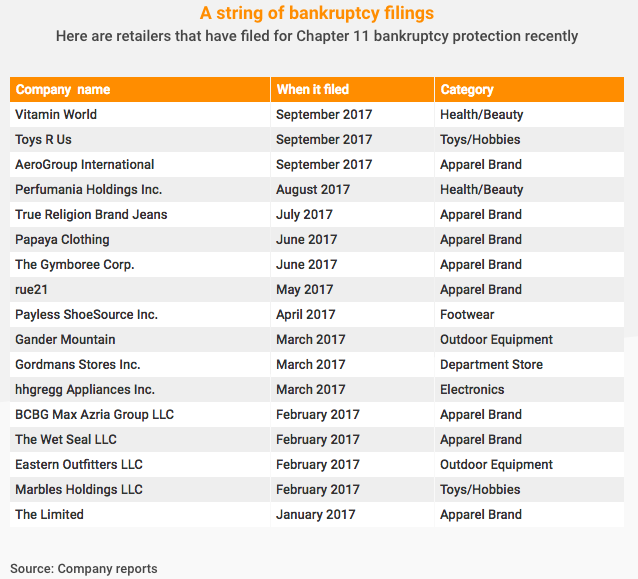 Some businesses are facing massive closures and potential bankruptcy. Many others, however, thrived through 2017 and can expect success in the months ahead. The holiday season provided an indiction for many market analysts which retailers would survive well into 2018 and which would fall. For instance, Sears and Kmart both saw sales drop somewhere between 16 and 17 percent while announcing plans to make multiple cuts worth $200 million in the near future, according to CNN. The company accrued up to $10.4 billion in losses since 2014 and currently has 1,400 stores. Many market analysts and those within the company feel as if Sears may not make it through the year before declaring bankruptcy. But multiple legacy retailers have already done so in markets that traditionally thrived in brick-and-mortar locations. For instance, Toys R Us declared bankruptcy in September of last year and Payless ShoeSource Inc. did so in April. Other retailers haven’t fallen to the same fate as companies like Sears and Toys R Us. Target, who may be within Amazon’s sights, saw sales from November to December rise above expected levels to 3.4 percent. In addition, Target’s online sales grew by 25 percent. The company has a new focus on e-commerce as they purchased Shipt in December to bring same-day delivery to a majority of their stores by this year’s holiday shopping season. –Brian Cornell, CEO and chairman of Target Corp.
New technology and business methods have allowed many companies to create an optimal omnichannel shopping experience for customers while at the same time boosting sales. Walmart recently built online order kiosks in some of their stores which allows customers to pick up their online orders in-store. Mobile payment options have also been popular for many retailers and customers alike. The platforms allow customers to pay for their products in-store from their phone. By capitalizing on the rise of m-commerce, retailers have put preference into the hands of the consumers to make payments in the method of their choice. Many companies are attempting to reach the same destination: a complete and comprehensive omnichannel for their customers. But such a business model isn’t exclusive to large corporations. Dirxion online catalogs give both retail and B2B companies a tool to create an omni channel approach for their businesses and aids any e-commerce operation. Both versatile and optimized with HTML5, Dirxion online catalogs ensure cross-platform and multi-browser performance standards are met. Consumers have made their mobile devices a more integral part of their daily lives, using them at higher frequencies for a wider variety of tasks. Plenty of data has been collected which established a connection between higher smartphone usage across the globe and the proliferation of m-commerce. As a side effect, consumers have taken other services and shown an interest in taking them mobile. Email has seen one of the biggest changes as consumer are becoming more mobile-friendly. In 2012, 29 percent of emails were opened on a mobile device, according to eMarketer, with desktop and webmail collecting 34 and 37 percent respectively. In 2017, 55 percent of emails were opened on a mobile device as compared to 28 percent on webmail services and 16 percent on desktop. In 2016, there were an estimated 238 million email users in the United States, according to Statista. In a different set of data, the United States is tied for second in weekly mobile email access rate globally alongside Italy and Japan. The data indicates 65 percent of mobile users in the U.S. accessed their email through a mobile device on a weekly device. Which means roughly 154 million users in the U.S. checked their email on a mobile device on a weekly device in 2016. Email marketing has become a popular method of engagement for many companies. In many instances, email marketing provides a direct avenue to customers via highly-visible push notifications. According to data from Statista, 48 percent of companies surveyed indicated they planned to expand spending on email marketing in 2017. The same amount of respondents said they plan on maintaining their current email marketing budget while only 2 percent planned on decreasing. Three-quarters of companies agree that email offers “excellent” to “good” ROI, according to a 2016 survey from Econsultancy. Dirxion online catalogs can aid a business’s email marketing strategies as the familiar layouts and designs give a campaign an additional layer of depth and interactivity. Printing and shipping charges are eliminated with Dirxion’s services, which give businesses a new and engaging method to attract customers. The mobile applications market recently recorded one of their largest holiday seasons in history. On Christmas Day alone, consumers globally spent $196 million on apps, in-app purchases and subscriptions in the Google Play and iTunes stores combined, according to Sensor Data. While the report excludes Android information from China, the data represents a 12.3 percent increase from the year before. The holiday season was especially profitable for Apple. Consumers spent a total of $890 million in the App Store in a week spanning from Christmas Eve to New Years Day, according to an official press release. New Years Day was the most profitable day in the history of the App Store. Consumers spending roughly $300 million in that single day and breaking the previous record’s $240 million set the previous year. Even so, Apple’s devices make up a smaller percentage of the mobile market when compared to Android devices. As of July 2017, 18.7 percent of all mobile devices globally run on iOS as compared to Android’s 73.39 percent. The gap closes, however, with respects to the amount of apps available on their respective stores. As of Jan. 2018, the App Store has roughly 2.2 million apps available to download whereas Google Play has 3.5 million, according to Statista. Worldwide, app downloads and smartphone usage are at an all-time high. Sense Tower estimates 92 billion apps across the Google Play and App Store were downloaded in 2017, a 13.5 percent increase from 2016. 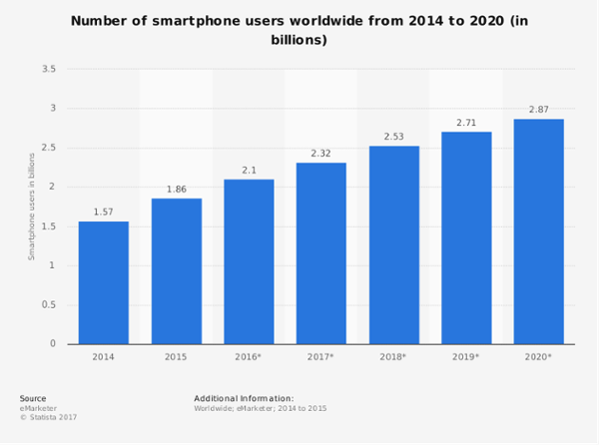 The smartphone market has been consistently expanding with a predicted 2.87 billion users by 2020. Consumer confidence has increased with new adjustments to mobile application monitoring and quality control in both stores. Dirxion offers app development for both the Google Play and iTunes stores. Within the apps, customers are able to view a business’s online catalogs or download them for offline viewing. The catalogs are interactive and optimized with HTML5. Dirxion apps that include keywords such as “online catalog” and outline the app’s performance capabilities have historically been better received by consumers. Companies without a dedicated e-commerce mobile app benefit from an audience built from a Dirxion online catalog app. The apps can give companies a direct avenue to a captive audience of customers via push notifications that can alert them of new catalog releases, upcoming sales and other pertinent company news. Google and Facebook have long held a dominant share in the online advertising market. The two companies have some of the largest user bases in the world. Google now processes over 2 trillion searches per year and Facebook passed 2 billion monthly active users earlier in 2017, according to Statista. But many ad buyers see that large user base as a disadvantage. Both companies dealt with controversy surrounding how advertisements are managed on certain sites and daughter companies. In response, many customers have adjusted their advertisement buying strategies. 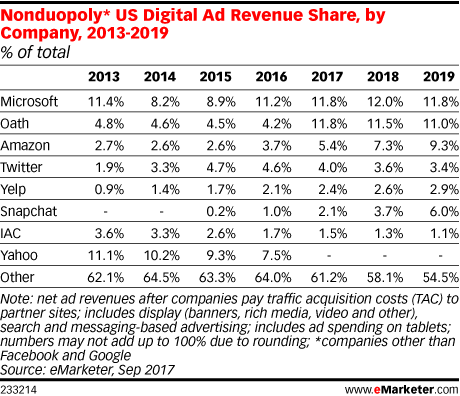 Many companies outside of the duopoly are seeing their revenue growing year-over-year. Google and Facebook still account for 63 percent of all U.S. digital ad revenue. Of the remaining revenue, companies such as Microsoft and Oath claim nearly 12 and 11 percent respectively, according to eMarketer. Looking at the same piece of data, it’s apparent the majority of companies tracked by eMarketer have experienced some sort of growth in the share of online advertising revenue. For instance, Snapchat had a 0.2 percent share in 2015 which is expected to grow to 6 percent by 2019. Amazon has also recently made a push into the online advertising market. Estimates from eMarketer predict Amazon currently holds a 7.3 percent revenue share of companies outside of the duopoly and is expected to reach 9.3 percent by 2019. Reports from CNBC allude to Amazon making expansions on both their e-commerce searches and video services. EMarketer estimates Amazon is the 5th largest online advertiser in terms of revenue, right below Google, Facebook, Microsoft and Verizon. Amazon currently allows businesses to promote their products in related searches but hopes to eventually give advertisers better data to allow for more precise demographic targeting. Outside of paid promotion search results, Amazon is exploring mobile advertisements, video advertising and their newly-released “Transparent Ad Marketplace” which allows customers to bid on ad space across the web. “Amazon likes to talk about how 56 percent of product searches are coming through Amazon. It’s definitely a stat that causes advertisers to stand up.” –Diana Gordon, senior partner at Mindshare. For e-commerce businesses, growing their websites through organic traffic is sustainable in the long-run, cuts costs that would be used to purchase advertising space and raises traffic at a higher rate than a PPC program would. Dirxion online catalogs offer SEO guide pages that involves indexing every page of the printed catalog. This practice helps boost the overall SEO of the online catalogs site. In addition, Dirxion online catalogs offer a variation of ad platform services for customers through widgets. The widgets, which come in a variation of sizes and implementations, can be either integrated into an existing advertising program or the customer can sell space directly to customers without having to use an external advertising service. With the holiday season having concluded, market analysts can now look at the data as a whole in order to make predictions for both the next holiday season as well as e-commerce in 2018. While pre-Christmas sales surpassed expectations, both physical retail locations and e-commerce sites saw increases in traffic and revenue. According to data from Salesforce, Dec. 26 saw a 19 percent increase in traffic, 5 percent higher than the year before. Retailers are seeing the beginnings of a new trend arising. 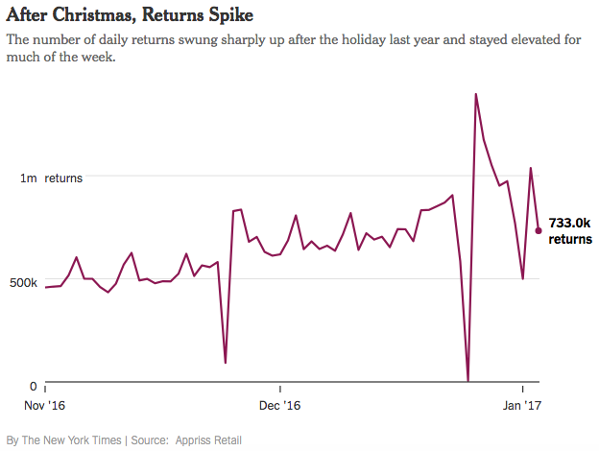 Many Americans now utilize the day after Christmas to shop while still on break from work. During what was previously known as a “retail lag” in which stores would attempt to get rid of outdated inventory, stores are now flooded with post-holiday shoppers. 40 percent of consumers shopped the day after Christmas, according to a survey from Deloitte. E-commerce continued to outpace retail in volume and growth. Amazon recently announced over 4 million consumers started a free trial or began paying for an Amazon Prime subscription in one week alone during the holiday season, as reported by Digital Commerce 360. There was an unexpected rise in traffic during the New Year’s as well. For instance, e-commerce traffic across the top 25 retailers in the U.S. rose by 15 percent on New Year’s Eve and 32 percent on New Year’s Day, according to data from Verizon Communications Inc. However, e-commerce and physical retail locations have shifted into a mutualistic relationship of sorts. Many consumers use physical retail locations to make returns on items that were purchased online. For instance, Kohls began accepting returns of certain Amazon items at 82 of their stores. Dirxion online catalogs offer businesses the ability to tap into shopping trends and habits during both the holiday season and throughout the year. Dirxion online catalogs also serve as a complementary product to any e-commerce operation. Both versatile and optimized with HTML5, Dirxion online catalogs ensure cross-platform and multi-browser performance standards are met. Amazon appeared in headlines all throughout 2017. Most noteworthy, however, was their $13.7 billion acquisition of Whole Foods in June. For months afterwards, market analysts discussed what the acquisition meant for Amazon, its competitors and the future of e-commerce as a whole. Now, in a market landscape in which Walmart’s e-commerce poses a threat, many have indicated that Amazon must continue to make new acquisitions and improvements to remain competitive. According to Gene Munster, Loup Venture co-founder, this means an acquisition of Target by Amazon. Walmart and Amazon began on opposite ends of the retail spectrum. With 4,672 stores, Walmart is one of the largest retailers in the U.S. and Amazon has long been dominant in e-commerce. However, the two are beginning to encroach into each other’s territory. In August of 2016, Walmart announced they acquired Jet.com for roughly $3 billion. Many market analysts questioned the decision, wondering why Walmart would spend billions of dollars on an e-commerce platform that wouldn’t directly bring substantial profits to the company. However, Walmart instead used Jet.com’s expertise to restructure and bolster their own e-commerce platform, Walmart.com. Since that acquisition, Walmart’s e-commerce operation achieved a 50 percent growth rate in 2017 with a 40 percent growth rate predicted for 2018. Amazon moved in the opposite direction, starting from its e-commerce base and trying to establish a physical presence. The company now sells their tech products and has Amazon Lockers for item deliveries and returns at select Whole Foods stores. 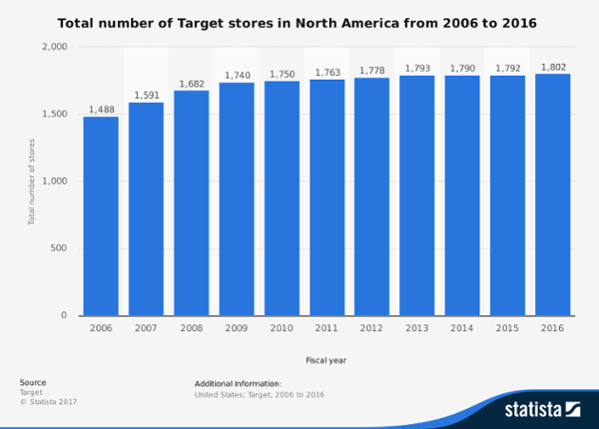 According to Munster, Target and Amazon have similar demographics and Target’s 1,828 stores gives Amazon a manageable, nation-wide brick-and-mortar presence. If Amazon wants to invest in storefronts, it has to be uniform and widespread. These types of predictions for Amazon have happened before. At one point in time, analysts thought retailers such as Lululemon Athletica Inc., Bed Bath & Beyond Inc. and Abercrombie & Fitch Co. looked appealing to the e-commerce giant. Regardless of the strategy, Amazon and Walmart are attempting to reach the same destination: a complete and comprehensive omni channel for their customers. But such a business model isn’t exclusive to large corporations. Dirxion online catalogs give both retail and B2B companies a tool to create an omni channel approach for their businesses and aids any e-commerce operation. Both versatile and optimized with HTML5, Dirxion online catalogs ensure cross-platform and multi-browser performance standards are met. Ulta Beauty’s investment in their e-commerce platform paid off. Earlier this year, it was reported the beauty salon company’s total traffic to their website increased by 74 percent with a 104 percent increase in mobile traffic alone. The result: Ulta Beauty’s online sales for Q3 rose by 62.8 percent from the same point last year. Online accounted for nearly 9 percent of all sales for the quarter. Improvements in the company’s supply chain lead to a 10 percent cost reduction to complete each online order, according to CEO Mary Dillon on an earnings call. Such improvements lead to the expansion of other programs, such “store to door” which allows customers to order items to be delivered to their house at no extra cost if they can’t find it in-store. M-commerce continues to be a focus of Ulta Beauty’s expansion efforts. Having re-launched their mobile application in Q3, the company saw their mobile traffic increase by 92 percent year-over-year. Ulta Beauty’s mobile app has been downloaded over 4.4 million times and has an average 4.8 stars out of 5 across the Google Play and iTunes stores. Dirxion has partnered with Ulta Beauty to provide the company with new avenues to connect to their customers. This is done by utilizing Dirxion’s integration technologies and e-flyers within Ulta’s mobile applications. 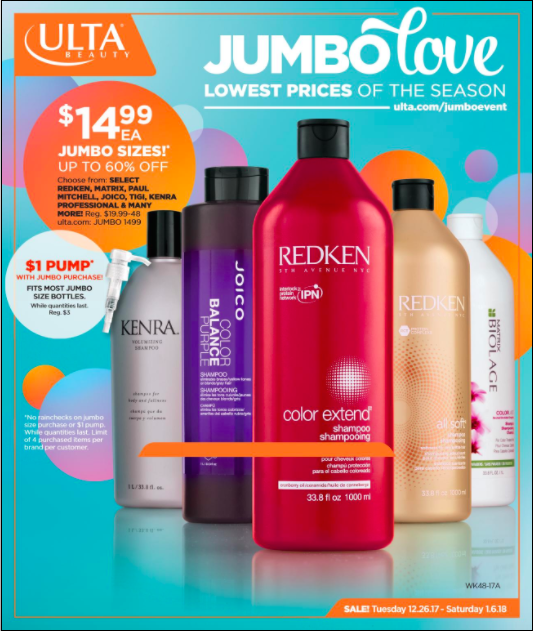 The e-flyer gives customers a new way to browse and purchase Ulta’s products in a format that can be sent to their customers at anytime from anywhere. This format also increases the efficiency in which Ulta can interact with and extend new deals to their customers. Integrated into their Google Play and Apple iTunes store applications, Ulta’s e-flyers receive a high level of exposure to their mobile customers. From the formation of stricter guidelines to a growing concern over fraudulent practices, online advertising went through a year-long adjustment period. Alongside record-breaking growth, the platform sought to settle into a sustainable format which delivers on promises to advertisers and customers alike. Estimates from eMarketer predict advertisers in the U.S. will spend almost $48 billion on online advertisements. Customers are predicted to move away from a more open-market approach towards purchasing advertisements. For instance, it was reported earlier this year that global revenue lost to the fraudulent advertising method “spoofing” could potentially reach $16 billion by the end of 2017. In addition to potentially lost revenue, advertisers have had difficulties in recent years using large platforms such as Google, Facebook and their subsidiaries. For years, such companies have held to the mentality that the web is too large to police; therefore, it’s hard to determine exactly where their customers’ ads will appear. In YouTube’s case, a daughter company of Google, multiple investigative reports and articles this year revealed advertisements were running on videos promoting hate speech or other illegal activities. For years, YouTube used to proudly display the volume of videos uploaded to their platform. Now at 65 years of video uploaded per day, that volume has become a challenge for YouTube to monitor and a warning sign to many advertisers. Many companies are returning to direct advertising buying, whether through digital or traditional platforms. Estimates from BIA/Kelsey predict local advertising spending in the U.S. will surpass $151 billion in 2018, a 5.2 percent increase from last year. 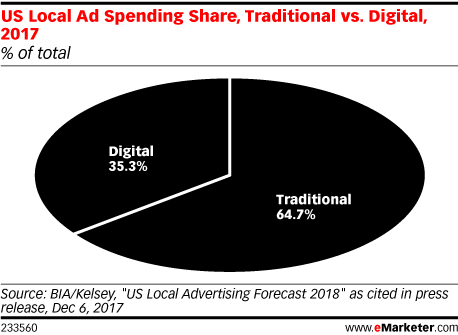 Despite online advertising’s consistent growth, traditional media such as newspaper and radio, still account for 65 percent of all local advertising spending in the U.S, according to BIA/Kelsey. For e-commerce businesses, growing their websites through organic traffic is sustainable in the long-run, cuts costs that would be used to purchase advertising space and raises traffic at a higher rate than a PPC program would. Dirxion online catalogs offer SEO guide pages that involves a process of indexing every page of the printed catalog. This practice helps boost the overall SEO of the online catalogs site, as well as increase the likelihood of someone finding a catalog page when searching a company’s brand name. In addition, Dirxion online catalogs offer a variation of ad platform services for customers through widgets. The widgets, which come in a variation of sizes and implementations, can be either integrated into an existing advertising program or the customer can sell space directly to customers without having to use an external advertising service.